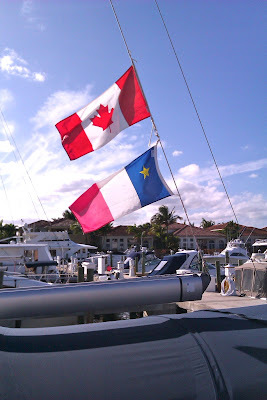 from Shediac New Brunswick Canada to the Caribbean. Visit from Mathieu on Easter Weekend ! On Wednesday, April 4th, Jean Guy and Roselind left early in the afternoon to go to the Miami International Airport. They knew the highways would be congested due to the opening of the Miami Marlins New Stadium based in Little Havana, a neighbourhood of Miami, Florida. The couple arrived at the airport 45 minutes early and both of them were anxious to see their second son, Mathieu. Finally, he showed up and all three of them were happy to see each other. He was down in Florida only for a short time and the captain and first mate were glad he could take time off from work to come for a visit. It had been over three months since the last time they saw him. The weather was hot during Mathieu's visit. One day, the weather was at 29 degrees C and with the humidity it felt like 37 degrees C, the hottest Jean Guy and Roselind had seen since they were in Florida. The three of them spend their days chatting, relaxing and visiting the vicinities of Hollywood and on Saturday morning, father and son drove south to Downtown Miami. They had lunch on Ocean Drive and in the afternoon, Mathieu wanted to go to Miami Beach which they did until the rain started pouring, they then headed back to Oasis. Later that night, they went at the Hard Rock Hotel and Casino in Seminole to listen to some live music. The next day, being Sunday and Mathieu's last day in Florida, the couple and son drove to Ft Lauderdale to see the boardwalk and the beach. It was a beautiful morning and not as hot as the previous days. In the afternoon, the captain, first mate and Mathieu were joined by Conrad and Mona for an afternoon sailing trip to Ft Lauderdale. 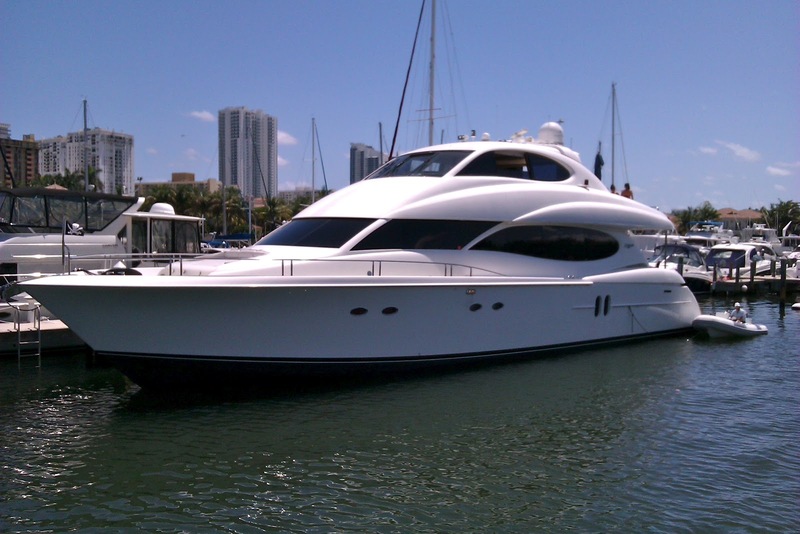 They navigated by the Port Everglades Cruise Terminal, passed by big yachts and beautiful mansions and the first mate was again overwhelmed by all the boat traffic on the water, especially in Ft Lauderdale. Everyone really enjoyed their afternoon. Mathieu really enjoyed sailing Oasis and was amazed by what he saw. Oasis trip to Ft Lauderdale was certainly the highlight of Mathieu's trip in Florida. The next morning, Mathieu flew back home and his parents felt sad to see him leave. Now only two days to prep Oasis for the next visitors. The captain and first mate were anticipating the arrival of the newcomers! 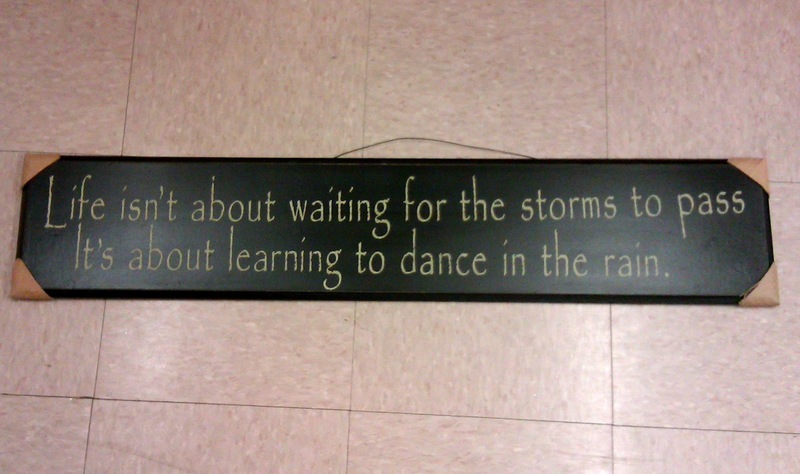 Mathieu took a picture of this plaque when he and Jean Guy were at the mall. Jean Guy admiring the luxury cars in demonstration at the mall. 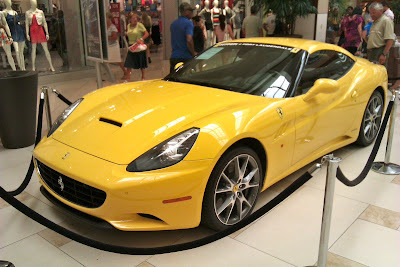 This one a Ferrari. Painted on the concrete wall in the parking garage, Mathieu found this funny, so he took the picture. Gulfstream Park on Friday night! After the three of them were done shopping at Aventura Mall, they stopped at The Gulfstream Park in Hallandale to show Mathieu around. While they were there, they decided to eat at the Playwright Irish Pub. Not a recommended place to eat. Thumbs down!!!! At the Casino, the buildings are illuminated with bright lights. 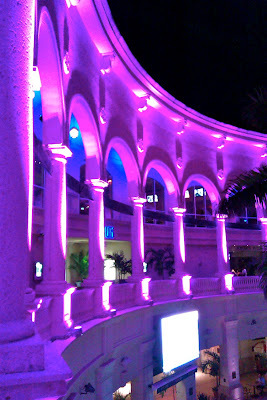 There a nice ambiance at night at the Gulfstream Park. Very bright neon colours show off the detail of the building's architecture! 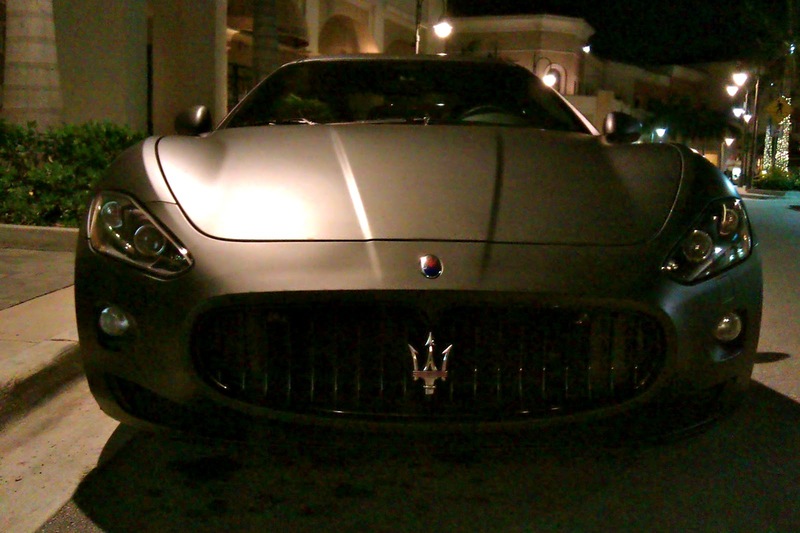 While walking on the street of the Village, this nice black Maserati was parked on the street. 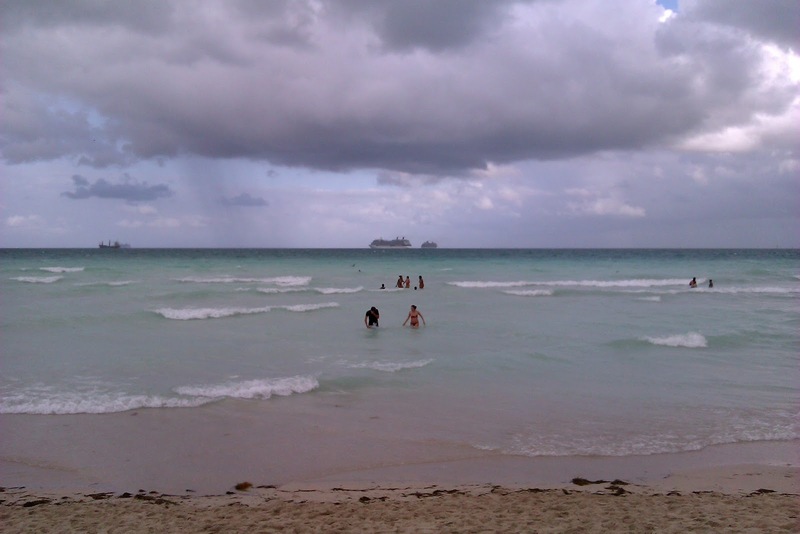 Miami Beach on Saturday afternoon! 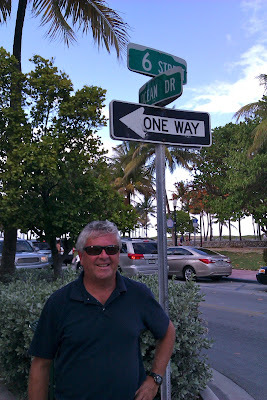 Jean Guy on the 6th street and Ocean Drive in South Beach. Mathieu walking and looking for a place to eat. Volley Ball Nets at Lummus Park in Miami Beach. 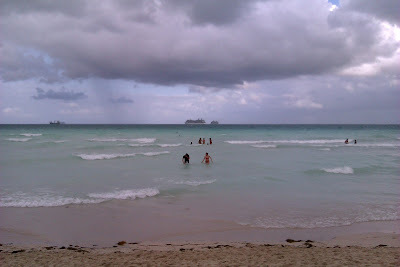 It was very cloudy but did not stop people being at the beach and swimming. But when it started to downpour with thunder and lightning, it cleared the beach in no time. 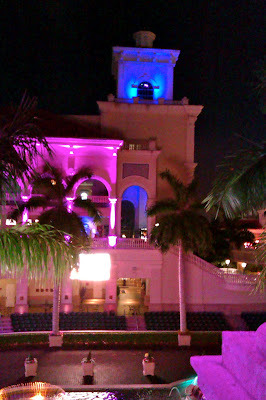 Seminole Hard Rock Hotel & Casino Hollywood at night! There was a live band playing outside. Very good music. Mathieu wrestling with an alligator. 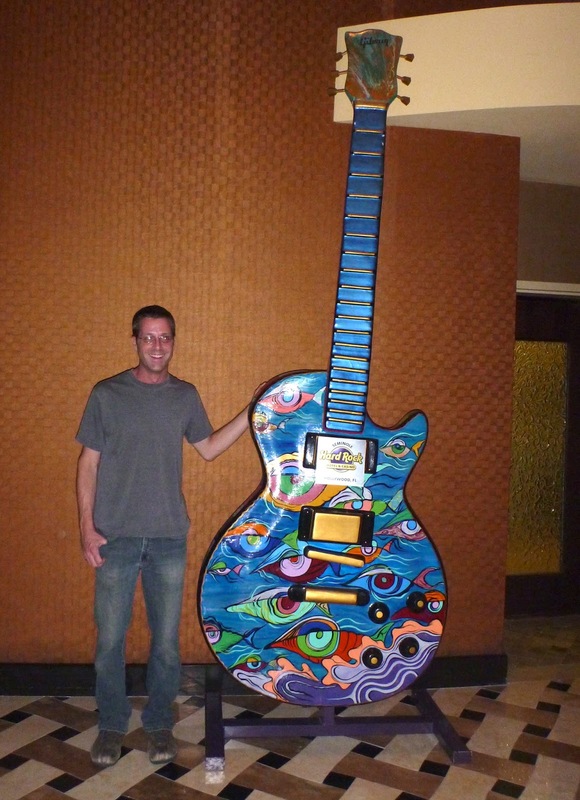 At the Hard Rock Hotel. Ft Lauderdale Boardwalk, Sunday morning! Jean Guy and Mathieu walking along the boardwalk of Ft Lauderdale. 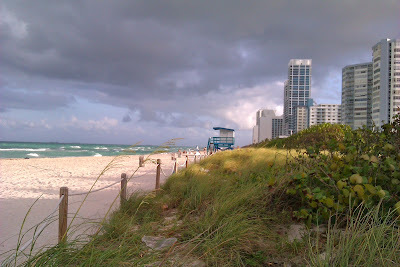 Looking north at Ft Lauderdale Beach. The captain and First Mate posing at Ft Lauderdale by the boardwalk. Father and son watching the traffic go by. Looking south at Ft Lauderdale Beach. Yes, that is definitely a BIG dog! 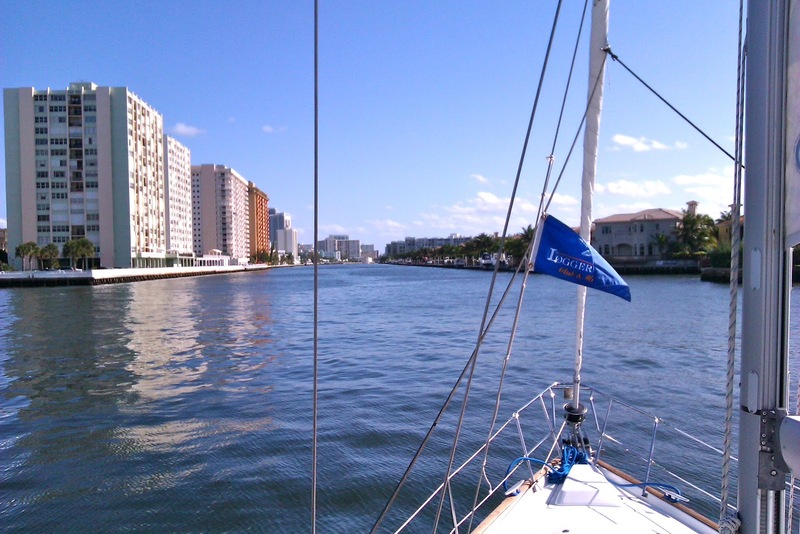 Sailing to Ft Lauderdale in the afternoon! Leaving Oasis's berth at Loggerhead, this beautiful powerboat docked at the end of a finger of the marina. Another nice boat docked at Loggerhead. Sailing in the ICW, on the way to Ft Lauderdale. 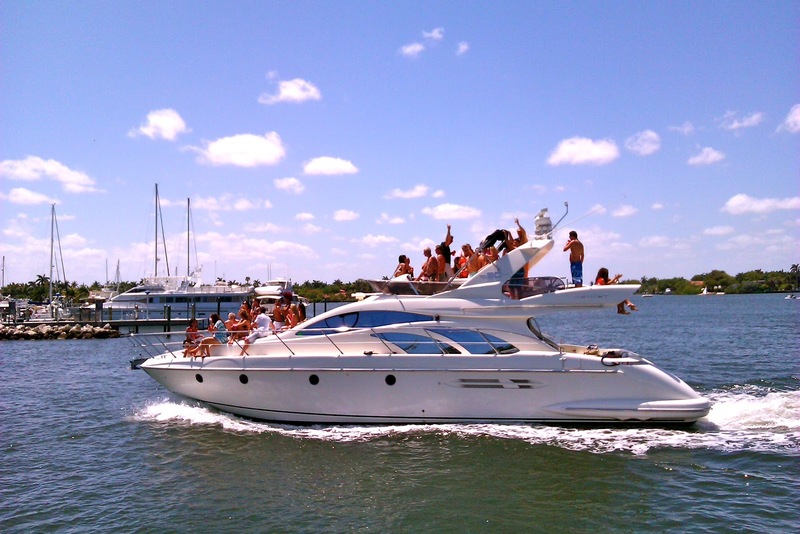 Looks like a party boat! We wondered if it was allowed to have that many people on board? At least they were wearing life jackets! Mathieu was enjoying the scenery. At Port Everglades, the water was choppy and there were a lot of currant. On the way to Ft Lauderdale, Oasis waited for the SE 17 St. Bridge to open, so she could go through. The captain wasn't sure if there enough clearance to go under, the vertical clearance being 55 ft high. 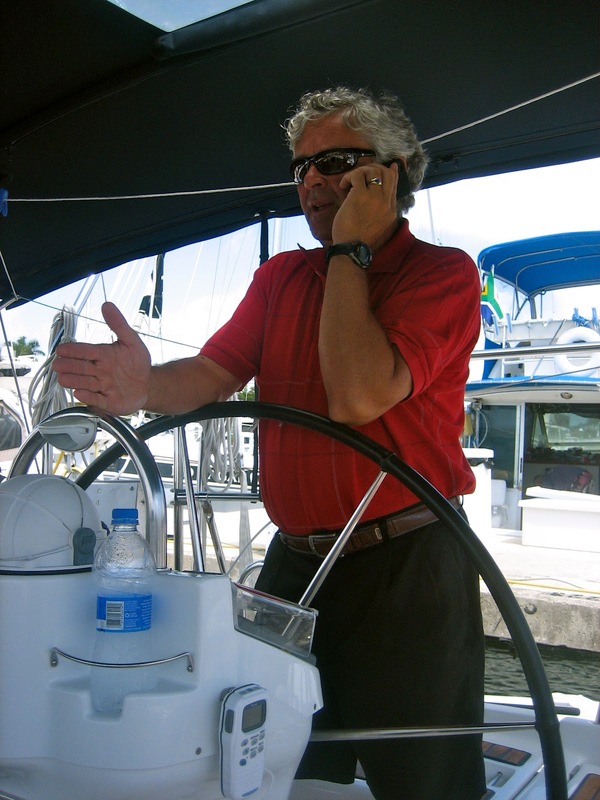 The captain enjoying his sailing trip to Ft Lauderdale. 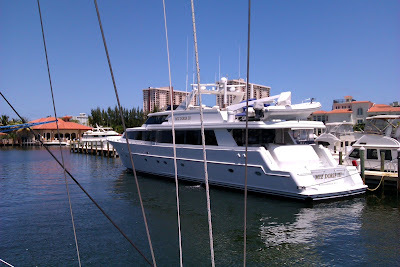 The 50 foot catamaran, Spirit of Lauderdale is a charter vessel. Row of powerboats docked at the Hall of Fame Marina. Those mega yachts are always impressive every time you see them. Big yachts docked in front of beautiful homes. 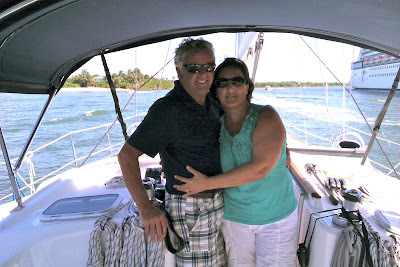 Conrad, the captain's cousin and wife Mona joined the Bourgeois's for the sailing trip to Ft Lauderdale. This mega yacht docked in front of this property is actually 120 feet long. On the ICW, south of Las Olas Islands, there's an area with shallow waters and boaters were anchored and people swimming. Nice tall ship docked at the Yacht Regency Pier 66. On the way back from Ft Lauderdale, this time Oasis went under the SE17 St. Bridge.Tides were low and it permitted Oasis to go under without any problems. The captain and first mate both enjoying the trip. and Mathieu drove Oasis for a while and enjoyed every bit of it. Coming back to Loggerhead, the water was calm in the ICW. The captain proudly displayed the Canadian and Acadian Flags on Oasis. Roselind and Mathieu, happy to be together. Relatives visiting Jean Guy and Roselind on Oasis. Three and a half weeks went by before Jean Guy and Roselind had more visit from NB. 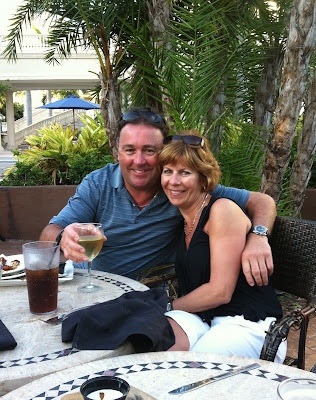 The couple had plenty of time to relax and enjoyed being in Florida. The weather was gorgeous, barely no rain and the weather meter at 25 degrees during the day and around 20 degrees at night. They visited people they knew that were in the area including two of the captain's cousins which they visited on different occasions. Now they were waiting for the arrival of the captain's brother and wife. On Saturday, March 17, the couple picked up Marcel and Marie Louise at the Ft. Lauderdale International Airport. It was nice to have relatives come down to visit and the captain and first mate were looking forward spending quality time with them. The four of them had a busy week. 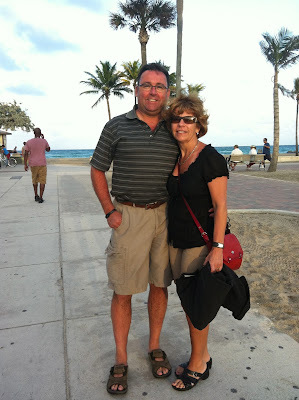 They went to the beach, did some golfing, shopping, ate in nice restaurants, and also visited some attractions around the vicinities, but the highlight of their week was the sailing trip south to Biscayne Bay. The captain was in such delight just thinking of the wind blowing in Oasis's sails again. He'd really missed sailing. On the way down south to Biscayne Bay, Oasis had to go through 11 bridges and the captain had one big concern, there was a fixed bridge with 56 foot of vertical clearance. He knew that Oasis had gone under a 57 foot bridge before, so he scheduled the trip for when the tides would be lower to make sure Oasis could go under the bridge without any problems. On this sailing day trip, the captain and first mate were joined with Marcel, Marie Louise, Conrad, the captain's cousin and wife Mona. Upon entering Biscayne Bay, around Status Mile 1100, the captain anchored Oasis while the girls prepared lunch and after everyone were satiated with their meal, the captain hoisted the anchor and opened Oasis's sails. The wind was blowing between 18 to 20 knots. Everyone was so delighted being on Oasis on such a beautiful day and also being able to sail in the beautiful turquoise waters of Biscayne Bay, it surely made this sailing trip, one to remember. 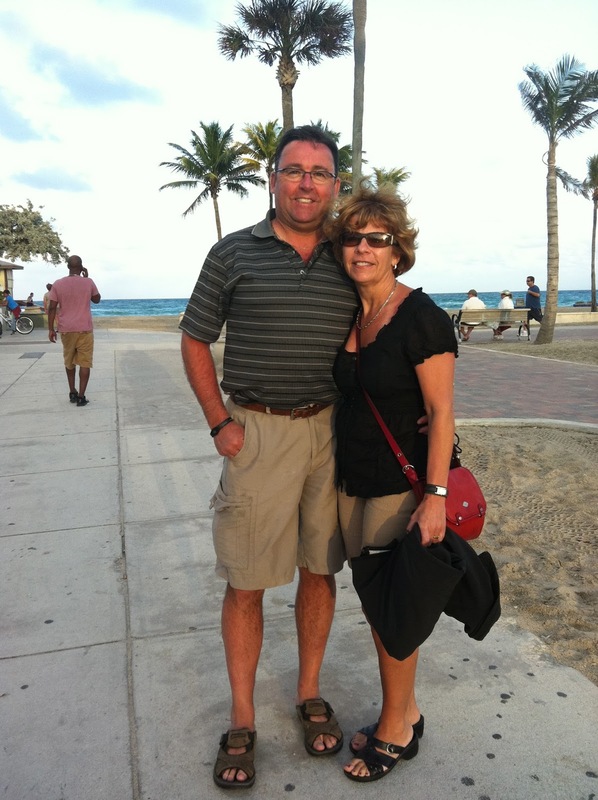 On Saturday, March 24, Marcel and Marie Louise left for home in NB. Jean Guy and Roselind felt bittersweet again. The departure of loved ones always made them feel sad. They had spend such a wonderful week with the captain's brother and wife. They had many laughs together and really enjoyed each other's company. The captain and first mate will always cherish the time spend with them. Now only eleven days before the arrival of another visitor! Sunday March 18, 2012, A Day at the Beach! Sunday morning, Jean Guy and Roselind headed to the Beachside Cafe at Hallandale Beach for Breakfast. They were accompanied by Marcel, the captain's brother and wife, Marie Louise. Then they headed to the Hallandale Beach. Once at the beach, all four were joined by Conrad, the Bourgeois 's cousin and wife Mona. Roselind and Mona enjoying the nice weather. Roselind and Marie Louise relaxing and getting some sunrays. Marcel and Mona having a good laugh! Jean Guy, Conrad and Marcel enjoying the good life! A view of Hallandale Beach looking north. The three guy's having a swim in the beautiful turquoise water. Jean Guy relaxing in the sun after a good swim. They sheltered from the sun, the weather being very hot. 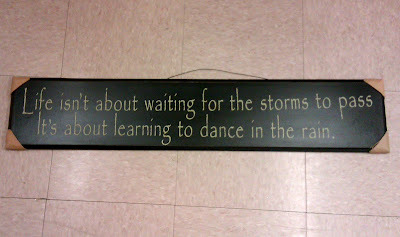 Monday March 19, 2012. Sailing Trip to Biscayne Bay. Marcel getting Oasis on her way for the day sailing trip. Getting into the ICW just around the bend from Loggerhead Marina. Marie Louise taking some pointers from the Captain on how the instruments operates. Marie Louise enjoying the moment! Mona's first time on a sailboat, she was looking forward to her new adventure. Wider Yachts, a day cruiser with the concept of space. The cockpit is widen with two extensions on either side of the hull doubling the walkable surface and increasing the boat's stability at anchor. Conrad and Marcel relaxing and enjoying the scenery of the ICW. Hallandale Beach Bridge opening, the first of the day's trip. Conrad and Mona's first sailing trip. Marcel and Marie Louise relaxing and snuggling. 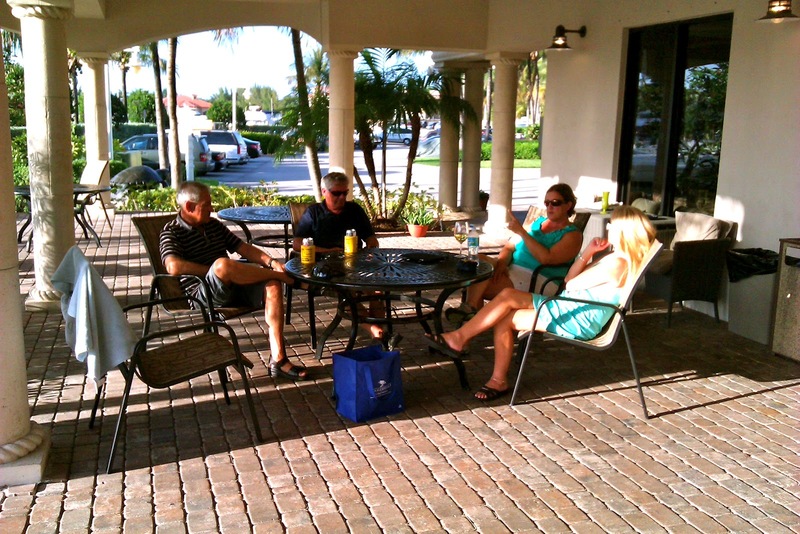 All four guest enjoying the scenery of the ICW. Oasis on the ICW, at Golden Beach. First Mate and Marie Louise relaxing and enjoying the scenery on Oasis's bow. On Oasis's starboard side at Sunny Isles Beach. Conrad and Mona relaxing and enjoying the day trip. Oasis crossed powerboats and sailboats on her way to Biscayne Bay. 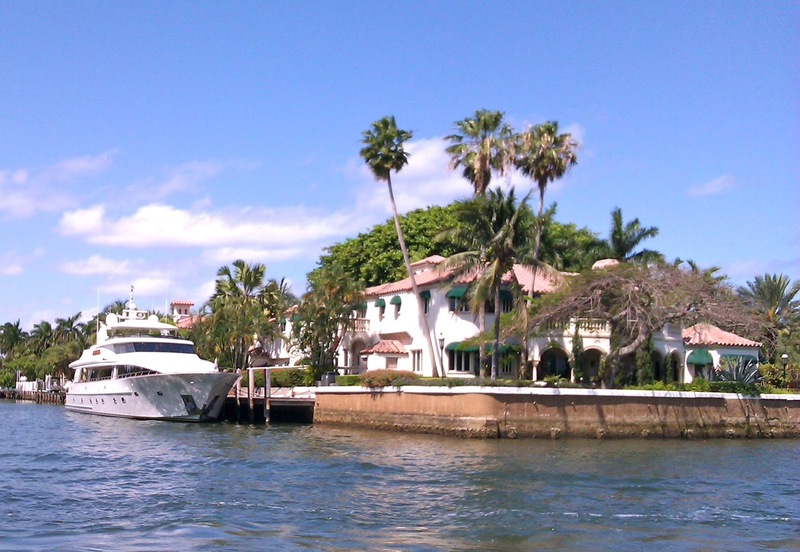 Navigating through Broad Causeway at Bay Harbor Island. Just before crossing MacArthur Causeway. 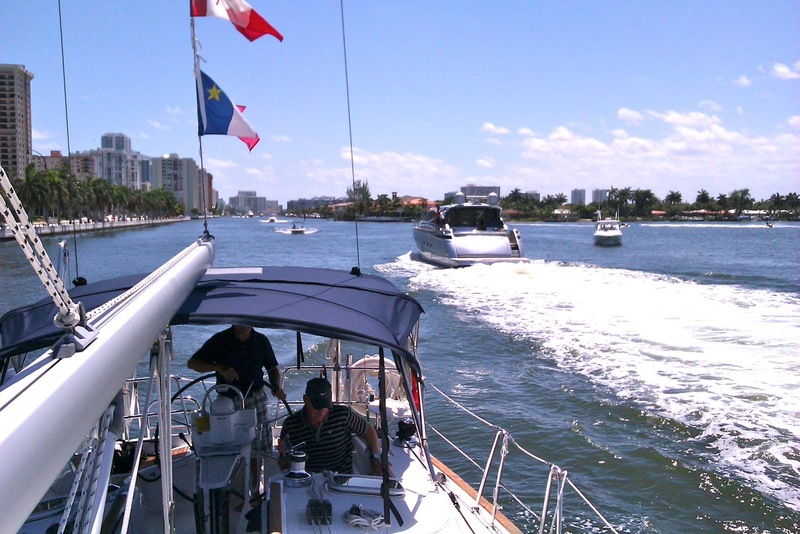 Navigating in the ICW at the Miami Inlet. Ahead on starboard is Downtown Miami. Miami's Cruise Ship Terminal on Dodge Island. Closer look of Downtown Miami. Oasis passing by Tequesta Point on Brickell Key. On Oasis's starboard side; Brickell, south of Downtown Miami. The Captain enjoying the scenery. 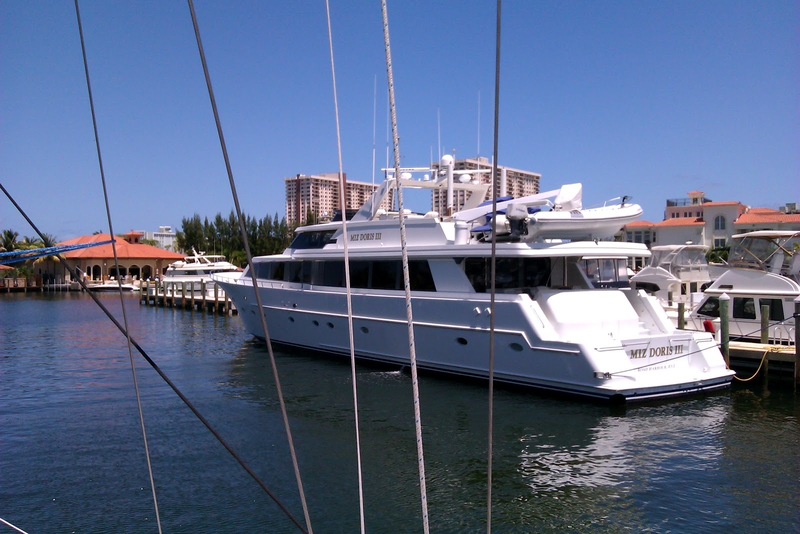 After anchoring Oasis in Biscayne Bay, the crew sat down for lunch. The captain and sister in law having the giggles. Oasis sailing in the beautiful Biscayne Bay. All four guest enjoying the view and the beautiful turquoise water. Conrad and Mona having a good time. Here, the youngest of the three couple at their highlight of their trip! Mona and Roselind relaxing on Oasis's bow. Mona holding on Oasis's shrouds while sailing. View of a Royal Caribbean Cruise Ship at her dock. Conrad fished a nice sea trout on the way back. Nice property on the ICW. The building on the left is the Hallmart; where Conrad and Mona are staying. 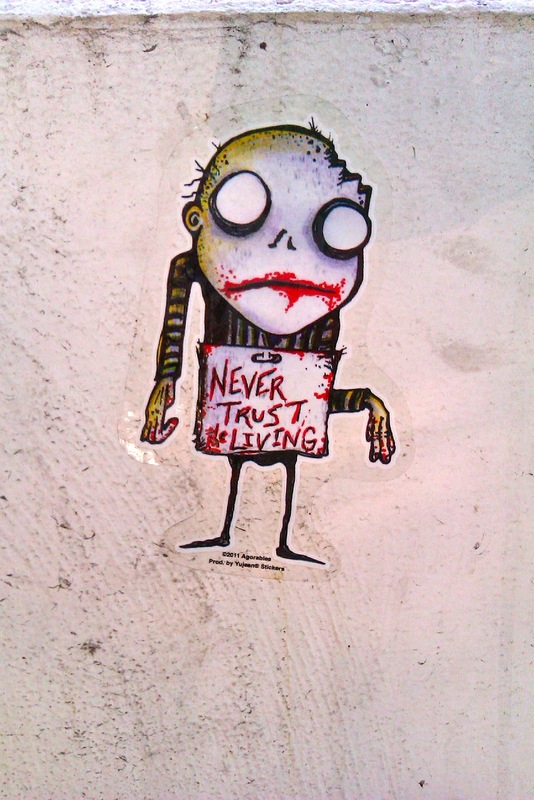 Tuesday March 20, 2012. Girls at the pool & Guy's golfing! As previously put in other blogs, a view of the pool at the Loggerhead Club & Marina. Roselind and sister in law Marie Louise spend time at the pool while Jean Guy and his brother went golfing. This iguana is a common visitor at the pool. At Hollywood Beach! Marcel admiring this nice motorcycle. Marcel and Marie Louise posing at Hollywood Beach! Jean Guy and Marcel having lots of laugh after almost emptying the bottle of Rum. The captain was calling Marcel "Mon Petit Frere". Wednesday March 21, 2012. Carrie B Cruise & Ft Lauderdale. Marcel and Roselind in good spirit. The first mate had made a bet of $20.00 with Marcel and she had lost. Of course Marcel kept reminding her of it and was the joke of the week! Jean Guy talking on the phone, he was enquiring of the value of a certain car that was for sale. At the end, he decided not to purchase it. 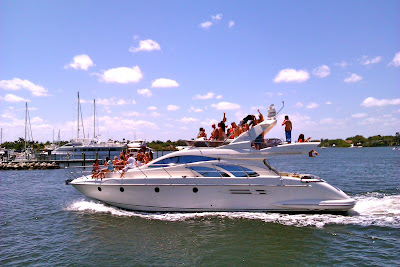 On the Carrie B Cruise at Las Olas Blvd. The young couple on the cruise boat. The palm trees that were planted on this property costed $15,000.00 each, being the tallest one in Florida. Very nice property. Another huge and exquisite property! Closer view of the above! 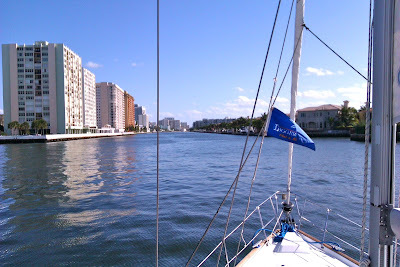 Ft Lauderdale Inlet to the ocean. The Mega Yacht, Paraffin! Built in 2002 and her name hints at her original owner's profession, an American Family who made their fortune producing candles. It is for sale; asking price $44,750,000 Euro. Outback, Another Mega Yacht docked in Ft Lauderdale. 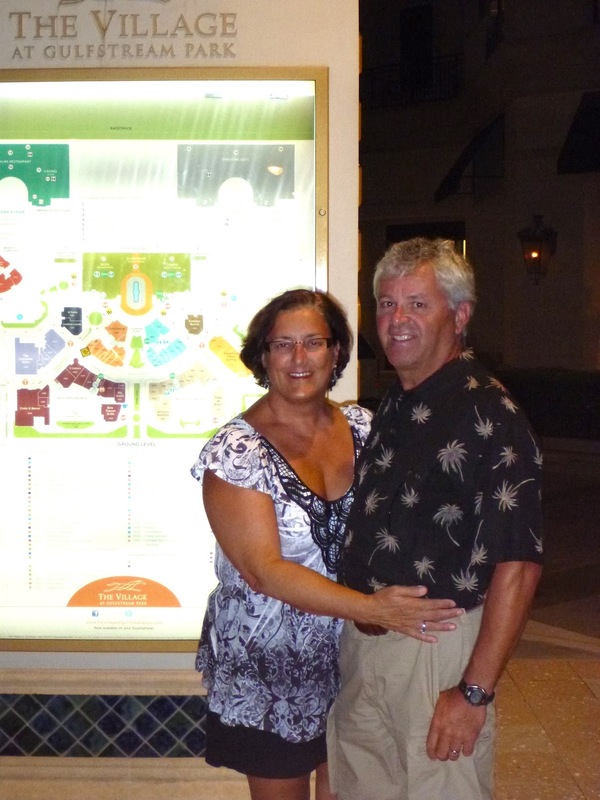 After the Carrie B Cruise, the two couple drove to Ft Lauderdale to stroll along the Boardwalk. The Ft Lauderdale Beach surely attracts young people during March Break. Marcel & Marie Louise sitting on the wall of the Boardwalk. Jean Guy & Roselind enjoying time spend at the Boardwalk. Thursday March 22, 2012. Swap Shop & Golfstream Casino! On this Thursday morning, Jean Guy, Roselind, Marcel and Marie Louise went at the Swap Shop, on West Sunrise Blvd in Ft Lauderdale, a Giant Indoor and Outdoor Flea Market. Some of the shopping was under a big dome. While some of the shopping is indoor, both couple mostly wondered outdoor in the bright sunshine. They had heard of this place and wanted to see what it consist of. An interesting place! The Village at Gulfstream Racing & Casino Park! Showing off the horses for the betting. Each couple had put a bet on a selected horse race and guess who won? Of course, who else than Jean Guy! He had bet that horse #4 would win and he was right. He had won $29.00 total. Mona, Roselind and Marie Louise having fun. All three couple posing at the Horse Racing Track. At the Cadillac Ranch Restaurant, where the whole gang had dinner. Marcel and Marie Louise enjoying the time spend at the Gulfstream. There was outdoor entertainment at this restaurant. Very good reggae music. And Jean Guy getting warmed up to sing! And Mona was too shy to sing! And by the end of the evening, Marcel sang and did a good job at it! Beautiful cars like this Ferrari was often seen in Florida! 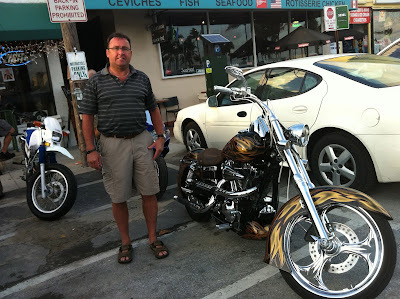 This one seen at the Gulfstream. Friday March 23, 2012. Dinghy Ride in the morning & Golfing in the afternoon! In T-Ben, Jean Guy, Roselind, Marcel and Marie Louise took a dinghy ride around the Loggerhead Club & Marina and also along the ICW. Another nice property around the Marina! Marie Louise enjoying the ride. With these huge mansion, we barely saw anyone there. We always wonder if this property is where the owner lives or just a cottage? Getting ready for another swing. Huge tree at the golf course. Marcel & Marie Louise posing in front of that huge tree. The last evening with Marcel and Marie Louise was spent in Las Olas Blvd strolling the street and the four of them ended the evening with a nice dinner at La Bonne Crepe on Las Olas Blvd.